This game gives a whole new meaning to the term Beer Goggles. 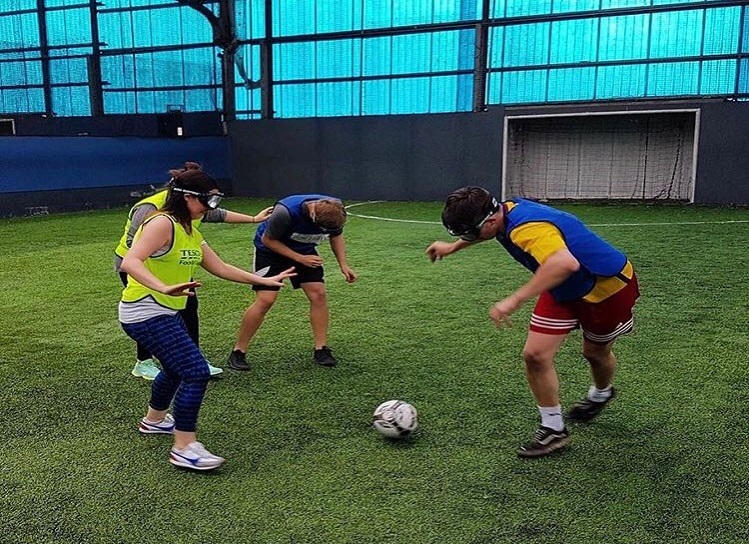 Goggle Football consists of playing a game of 5-a-side football wearing uniquely designed goggles that impair your field of vision. The goggles give the illusion that the ball is either much closer to you, or much further away from you than it actually is. As you can imagine this makes for some seriously funny football. Fresh air kicks galore! Players work in teams to race around circuits set out by the host. The first team to get back wins. Sounds simple ? In theory yes in goggle football not quite. Watch as your team mates adopt new running techniques and comical poses as they navigate their way around the circuit. In this game players make ring around one or two goggle footballers. The people on the outside have 1 football between them and no goggles the people in the middle have goggles on and no football. 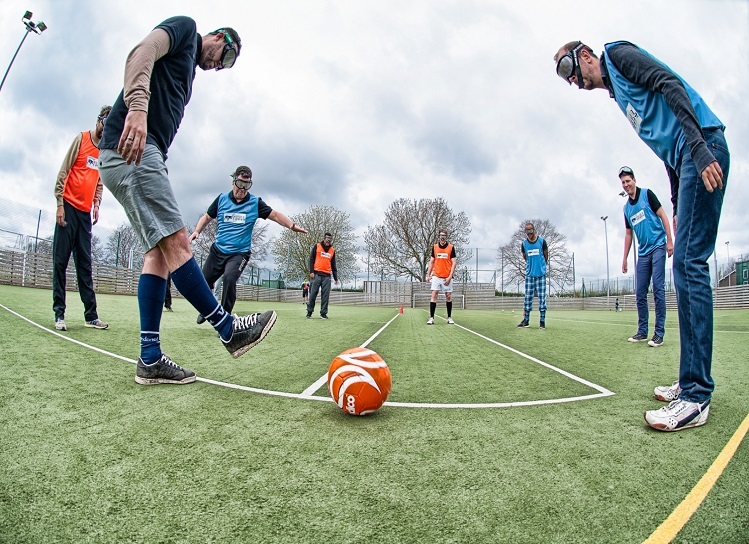 The aim of the game is to keep the ball moving around the circle without passing to the person to your right or left and without letting the goggle footballers win the ball off you. A regular game of penalties with a twist. The penalty taker will be wearing the goggles and they must spin around 5 times then release a shot at goal if it goes in its a goal. Easy ? maybe not but funny ..... definitely. This game wont be without a few fresh air shots and red faces. Players gather in the middle of the pitch and take aim at the goals. With goggles on the players have one attempt to strike the ball and hit the cross bar. A very old school game with a little twist. Two teams compete against each other to try and score more goals than the other. Firstly two teams are made and set up at opposite ends of the pitch. The players must run (one at a time with goggles on) up and around a cone on the half way line then turn back so they are facing the goal next to their team mates. Someone will then feed a ball in and the player must meet the ball and strike at goal. Once you have shot at goal the next player in your team gets ready to go. The team who scores the most goals wins ! A normal game of 5 a sides with goggles. All players wear the goggles and play an 8 minute game, 4 minutes each way. The team with the most goals wins. The goggles bring the fun into 5 a sides ! Perfect for Stag/Hen Doo's, Kids Parties, Sports Days, Corporate & Team Building Events. Add this to your Bubble Soccer mega mix for additional football fun. 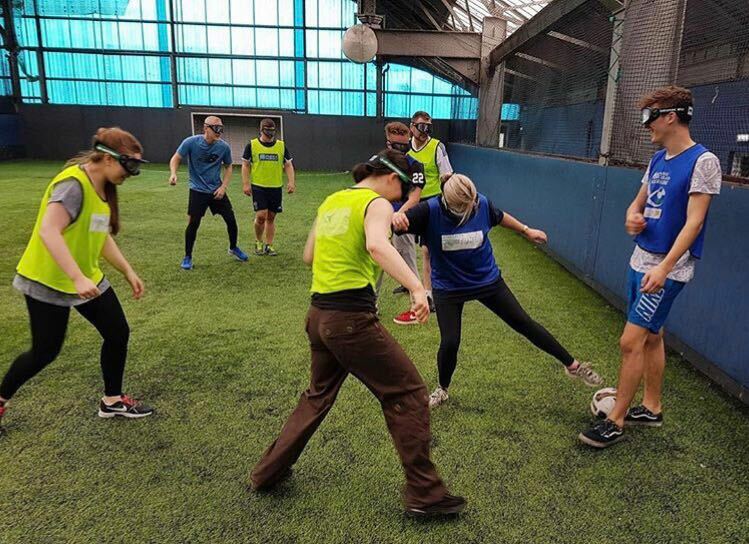 Our Goggle Football sessions are packed with action from start to finish & we aim to tailor the event to your taste. 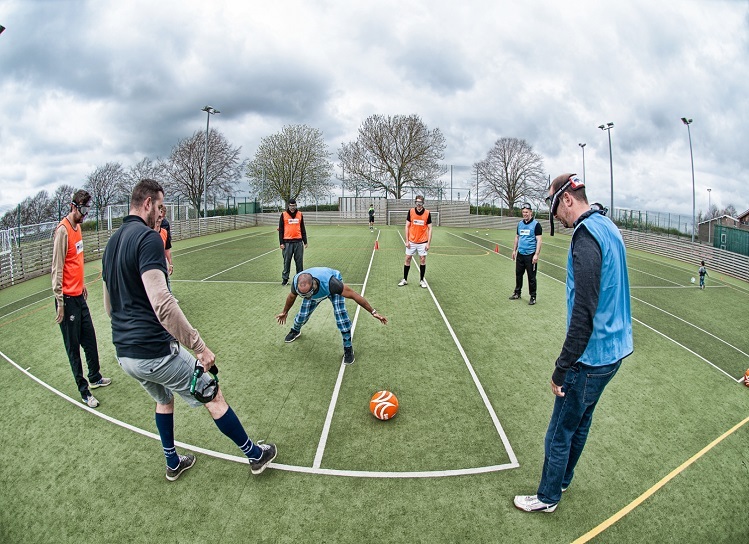 Goggle Football aims to provide the best possible experience: there will be laughter, fun, banter & much more laughter, whatever your age guaranteed you'll have a ball!